Annual health care costs and lost earnings in the United States from low-level but daily exposure to hazardous chemicals commonly found in plastic bottles, metal food cans, detergents, flame retardants, toys, cosmetics, and pesticides, exceeds $340 billion, according to a detailed economic analysis by researchers at NYU Langone Medical Center. The investigators who performed the calculations say the massive toll from everyday contact with endocrine- disrupting chemicals amounts to more than 2.3 percent of the country's gross domestic product. Included in the team's analysis, described in the The Lancet Diabetes & Endocrinology online Oct. 17, are estimated costs from more than 15 medical conditions linked by previous research to toxic levels of these chemicals. Scientists say chemical exposure occurs through gradual ingestion and buildup of these toxins as consumer products are used and break down. According to researchers, endocrine-disrupting chemicals have for decades been known to pose a danger to human health because the compounds can interfere with natural hormone function. Such chemicals include bisphenol A (BPA), commonly used to line tin food cans; phthalates, used in the manufacture of plastic food containers and many cosmetics; PCB-like polybrominated diphenyl ethers, or PBDEs, found in flame retardants in furniture and packaging; and pesticides, such as chlorpyrifos and organophosphates. However, the researchers say their new analysis, which took three years to complete, is the first U.S. assessment of the costs associated with routine endocrine-disrupting chemical exposure and resulting increases not only in rates of neurological and behavioral disorders, but also in rates of male infertility, birth defects, endometriosis, obesity, diabetes, and some cancers, as well as diminished IQ scores. 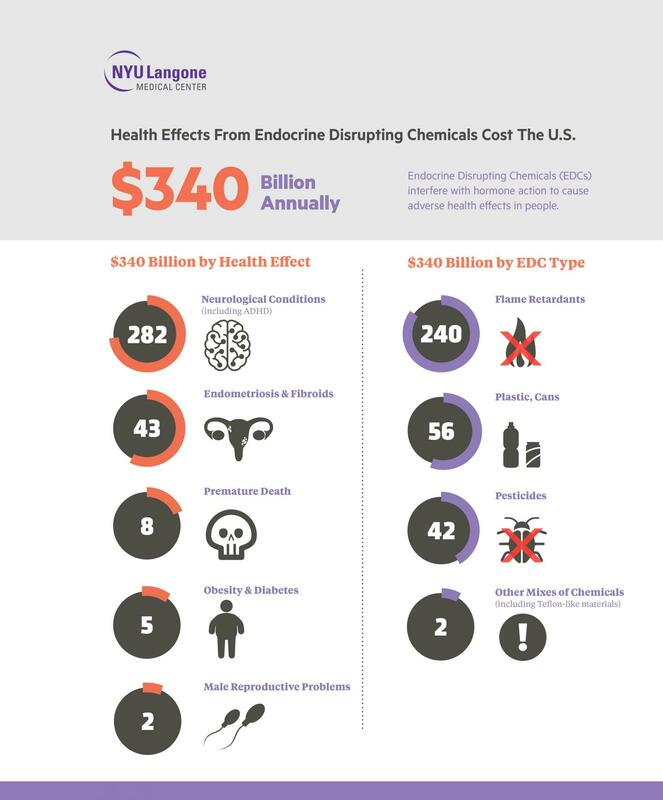 "Our research adds to the growing evidence on the tremendous economic as well as human health costs of endocrine-disrupting chemicals," says study lead investigator and health epidemiologist Leonardo Trasande, MD, MPP, an associate professor at NYU Langone. For the new study, the NYU team reviewed blood sample and urine analyses for documentation on the presence of endocrine disrupting chemicals in participants in the National Health and Nutrition Examination Survey. Since 1999, NHANES, as it is known, has gathered information about the prevalence of and risk factors for major diseases by annually surveying 5,000 volunteers. Advanced computer models were then used to project disease totals attributable to chemical exposure and to calculate the estimated health costs and lost income for each disease. According to Trasande, their analysis shows that yearly exposure to highly toxic fire-resisting PBDE chemicals and pesticides accounted for nearly two-thirds of the total endocrine-disrupting chemical disease burden, and mostly from neurological damage these chemicals cause in the unborn. Specifically, he says, annual PBDE exposure was estimated to account for 11 million lost IQ points in children, an additional 43,000 cases of "intellectual disability," and an associated disease burden of some $266 billion. Meanwhile, pesticide exposure was estimated to cost 1.8 million lost IQ points and lead to 7,500 more disability cases each year, with total health costs of $44.7 billion. Trasande says such PCB-like chemicals are more widely available in the U.S. than in Europe, where the chemicals are more tightly regulated, and whose data were studied by the same NYU Langone team last year. The team estimated the chemicals' disease impact there at more than $100 billion. "Based on our analyses, stronger regulatory oversight of endocrine-disrupting chemicals is needed, not just in Europe, but in the U.S.," says Trasande. "This oversight should include not only safety tests on the chemicals' use in the manufacture of commercial products before the chemicals receive government approval, but also studies of their health impact over time once they are used in consumer products," he adds. Among the other key diseases attributed to endocrine-disrupting chemical exposure and factored into the team's calculations were over 1,500 estimated cases of autism and more than 4,400 cases of attention-deficit/hyperactivity disorder, or ADHD. More specifically, phthalate exposure was estimated to contribute to some 5,900 adults developing obesity; 1,300 cases of diabetes; 86,000 cases of endometriosis, which cost more than $47 billion; as well as 10,700 early deaths from heart and other vascular diseases, such as stroke. Trasande cautions that the statistical modeling used in the analysis significantly discounted disease numbers to account for likely as opposed to actual people with any particular condition. He says his team's calculations are on the "low end of the scale" and that if total disease numbers were fully included, then cost estimates for the actual economic burden of EDCs would be much higher. Senior study investigator Teresa M. Attina, MD, PhD, also of NYU Langone, says there are "safe and simple" steps families can take to limit exposure to endocrine-disrupting chemicals. These include not microwaving food in plastic containers or covered by plastic wrap, and washing plastic food containers by hand instead of putting them in the dishwasher. She says people can also avoid using plastic containers labeled on the bottom with the numbers 3, 6 or 7 (inside the recycle symbol), in which chemicals such as phthalates are used. Switching to "all natural" or "fragrance-free" cosmetics is also an option. Funding for the latest economic analysis was provided by National Institutes of Health grant R01ES022972, the Endocrine Society, and the Broad Reach Foundation.